Well, look at us, we have quite nearly survived the whole entire first month of the new year! I don't know about you, but I am genuinely excited about what this new year will hold. I have a feeling this is going to be a big year...good (or should I say God) things are going to happen! I wanted to share something fun with you that is coming up next month. 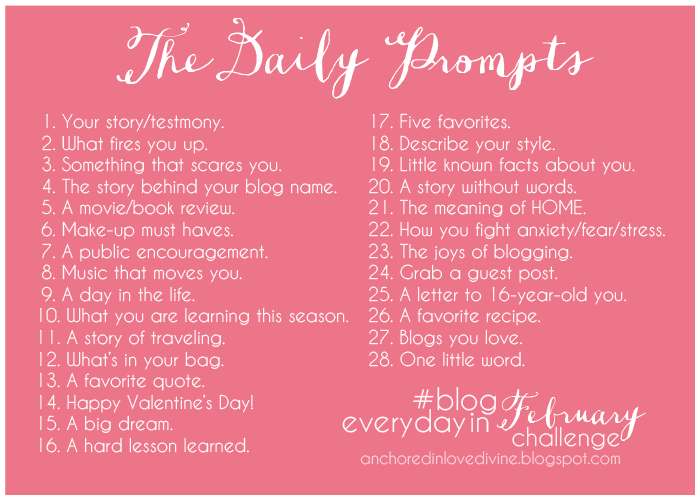 with her Blog Everyday In February Challenge! She even came up with 28 fun writing prompts to keep you inspired! But, I'll be straightforward with you, I don't think I'll be able to generate a post every.single.day! I do love her ideas though, and I've already selected my favs that I'm for certain going to blog about! Some of them aren't quite up my alley, so I'll try to throw a refashion or project post in its place. Would you like to join the party and blog along? Are there any topics in the list above that you would like to see me post about? I hope you are doing well and I'm sorry I haven't gotten in contact with you for so long. My time back in California has proved to be both busy and exhausting and the days are dragging by slower than honey. Great!! I am so happy you are going to do this too, it will be so much fun! :) Be sure to go to the Bailey's site (the links I have listed in the post) and let her know that you are going to blog along, she would love to know! You can link up with her posts too, that way everyone can hop around and read each others blogs! Yes, I am doing really well, this month has been a great start to a new year for me. I'm sorry to hear it is more difficult this second time. :( I'm praying for you! Keep your chin up, this too will pass. Just take each day at a time. I think trying to blog along in February will really help the time go by and give you something else to think about. :) Love you too! Fun idea! Looking forward to reading!